Filmmaking - There Was A Man Dept. He didn't look as he did in the movies, but I sure recognized him. Whatever quality he had on the screen floated around him like a wraith. You know what I mean. He was the crazed horse sniper in "The Killing," delivering lines through his teeth like an insane Kirk Douglas parody, working out the details of his grisly shooting job, all the while lovingly scratching a puppy. He was the condemned French soldier in Kubrick's "Paths Of Glory," set unfairly to die before the firing squad. His cellmate says a roach in their cell will outlive them, and Carey crushes the insect, commenting "Now you've got the edge on him." I talked to Tim Carey quite a while. He was very friendly and didn't mind. He really made my day. We talked about movie acting and Stanley Kubrick and Marlon Brando and Frank Zappa and Jack Nicholson and the indy feature movies Tim made with his own money. He raised and trained attack dogs now, and gave me his business card for his dog-training company "K-9 Attack Dogs." It was in my wallet for a long time, and then on my bulletin board, (next to Stanley Kubrick's phone number). I called Mr. Carey a couple of times, he was always nice, even though I wasn't in the dog market. I'm so glad I met him, he was an original. What a character in real life, and when the cameras started rolling, always completely perfect for the screen. Every movie he was in, he stole the frame, no matter who else was in it. Kirk Douglas, Marlon Brando, anybody. What a career. And talk about chutzpah - he once climbed over the Fox studio wall - in a suit of armor - to get an audition for "Prince Valiant." Can't beat that. Lots of people have been influenced by him. I know I have. Quentin Tarentino's script for "Reservoir Dogs" is dedicated to a list of influences. 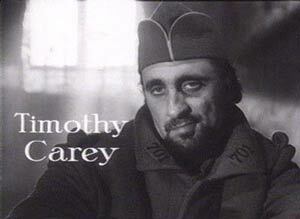 Timothy Carey heads that list. A Great Online Sound Effects Library.